Jeremy Corbyn ran into difficulty on a live radio interview today over Labour’s childcare offer as he failed to answer questions on the cost of the key pledge. Corbyn, who won praise for a calm performance on the Sky News/Channel 4 election special last night, was pressed repeatedly on Woman’s Hour this morning as to how much it would cost to expand childcare for all two to four-year-olds, regardless of their family’s circumstances. The Labour leader said the reform would “erm… obviously cost a lot” but was unable to provide a figure to Emma Barnett, a BBC interviewer. When pushed on the spending required to bring an extra 1.3 million children into universal free childcare, Corbyn answered: “I’ll give you the figure in a moment”. “You don’t know it? You’re logging into your iPad here – you’ve announced a major policy and you don’t know how much it will cost?” Barnett said. It prompted Corbyn to say: “Can I give you the exact figure in a moment please?” and insist he did possess the numbers. Labour had earlier published details of its plan to offer 30 hours of free childcare a week for all two to four-year-olds. It said it would abolish means testing for parents of those aged two and no longer restricting provision for three and four-year-olds to children whose parents are working. Barnett asked Corbyn if his uncertainty showed voters “cannot trust you with our money”. Corbyn countered by saying: “Not at all – all of our manifesto is fully costed and examined”. Barnett then told Corbyn that Angela Rayner, shadow education secretary, had described the annual cost of the pledge as £4.8bn. In remarks published last night Labour has said it would spend £2.7bn on capital investment in over the course of the parliament to boost childcare infrastructure. “The Labour party believes every child, no matter what their background, deserves a good start in life, and that childcare costs shouldn’t be a barrier for parents who want to go back to work. 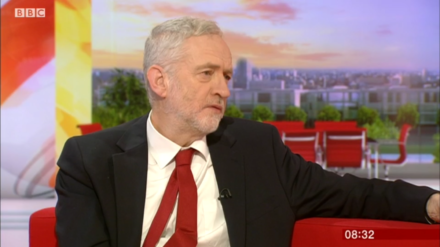 The current patchy support for childcare is holding back too many families,” Corbyn said.